Pope Francis greets Archbishop of Canterbury Justin Welby during a private audience at the Vatican Oct. 27, 2017. The Archbishop of Canterbury has said he is perfectly happy if members of the Church of England convert to Catholicism, and that it can even be "wonderful". In an interview with Fraser Nelson, editor of The Spectator, the Most Rev Justin Welby says he does not mind at all that many of Church of England clergy defected to Rome after the ordination of women priests. "Who cares?" he says. "I don’t mind about all that. Particularly if people go to Rome, which is such a source of inspiration. I had an email from a very old friend, an Anglican priest who has decided to go to Rome. I wrote back saying: how wonderful! As long as you are following your vocation, you are following Christ. It’s just wonderful. "What we need is for people to be disciples of Jesus Christ. I don’t really care whether it’s the Church of England or Rome or the Orthodox or Pentecostals or the Lutherans or Baptists. They are faithful disciples of Christ." 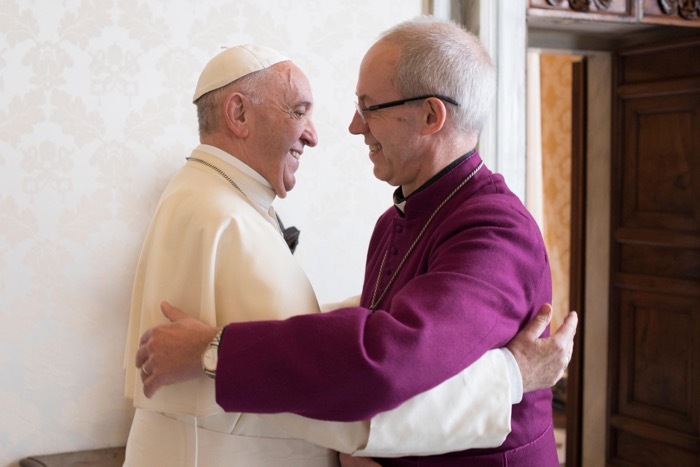 The Spectator reports that Archbishop Welby has a Catholic priest, Fr Nicolas Buttet, as his spiritual adviser and that one of his closest friends is Cardinal Vincent Nichols, Archbishop of Westminster. He also goes see the Pope regularly and they talk about personal things. His interview comes as Bishop Brian Farrell, LC, Secretary of the Pontifical Council for Promoting Christian Unity, suggests that after a difficult year for ecumenism, the churches might be at a new "turning point". Writing for The Tablet, Bishop Farrell acknowledges that not all is plain sailing. "To not a few, the traditional ways of doing ecumenism seem no longer capable of meeting new challenges coming from developments both within the Catholic Church and within the other Churches, our ecumenical partners." He says that practically the whole of Christianity is in a process of advancing beyond the controversies and competition of the past, towards greater understanding, trust and solidarity. "Pockets of mutual rejection and contention remain, but most of the world's Christians have come to recognise one another as brothers and sisters in Christ, united in a common baptism, and giving a common witness in serving the needs of suffering humanity." Events that happened in 2018 to make the ecumenical task more difficult included, in the Orthodox world, the establishment by the Ecumenical Patriarchate of an independent Orthodox Church in the Ukraine. Another crucial test, he adds, was around intercommunion, and the German Bishops' guidelines for admitting a Protestant married to a Catholic to Eucharistic Communion in some cases. "So, 2018 has seen new hurdles laid on the path of the search for Christian unity, both with the Orthodox and with the Protestant worlds." Bishop Farrell quotes Pope Francis who, in his most recent reference to relations with other Christians at Vespers in the Basilica of St. Paul Outside the Walls to mark the opening of the 2019 Week of Prayer for Christian Unity, said: “It is a grave sin to belittle or despise the gifts that the Lord has given our brothers and sisters, and to think that God somehow holds them in less esteem. When we entertain such thoughts, we allow the very grace we have received to become a source of pride, injustice and division... we must acknowledge the value of the grace granted to other Christian communities."